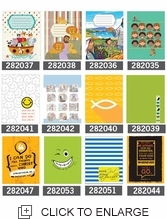 Brand new school notebooks with Christian themes. 4 notebooks for grades 1 through 3 with a sown binding. 4 notebooks for grades 4 through 6 with spirals. They contain pages for class schedules, multiplication tables, conversion table from Celsius to Fahrenheit, and the 4 high school students’ notebooks contain the periodic table of elements.